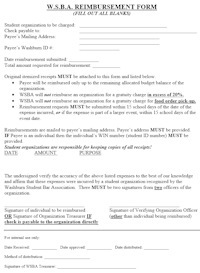 Contact WSBA Treasurer for reimbursement from allocated funds. Organization treasurer completes financial transactions. Complete the "Request for Reimbursement" form (for non-travel related expenses) and provide the form to the law school department that authorized the expense. This page also includes tips for traveling at law school expense to authorized activities [see below]. 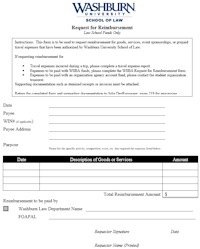 For expenses and reimbursements that are to be paid with Allocated Budget funds, please complete the WSBA Request for Reimbursement form (available from WSBA on their website at http://washstubar.wixsite.com/wsba/forms) and submit it to the WSBA Treasurer. WSBA officers will prepare a Payment Voucher form to generate a check for reimbursement or payment to a vendor. Note that if the vendor does not have a W-9 on file with Washburn University's Purchasing Department, a W-9 will need to be obtained from the vendor (if vendors are on this list, you do not need to obtain a W-9). Reimbursements to students do not need a W-9. Find the W-9 list at https://washburn.edu/faculty-staff/finance-office/forms.html. Department or Area Head: Either Dean Jo Hunt or Dean Jalen Lowry. GIFT CARDS: may be purchased for drawings, prizes, etc. Gift cards may not be used to give to individuals to purchase items for the organization. 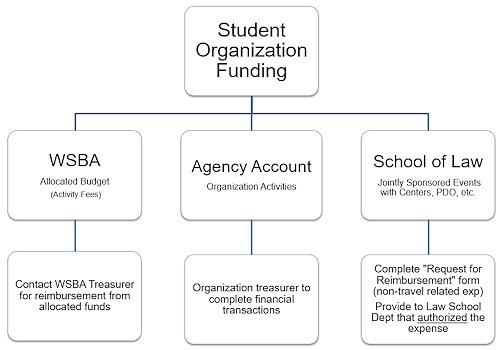 Agency Account Signature Authorization Form—Student Organization (also known as a signature card. Find the form at https://washburn.edu/faculty-staff/finance-office/forms.html. 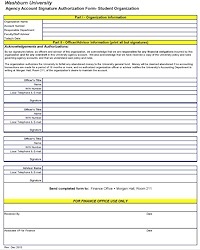 Form to be completed annually to update officer information. 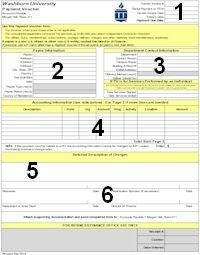 To obtain payment in advance or reimbursement from an Agency Account, complete a Payment Voucher form. speakers, performers, etc. are to be engaged for an activity or event when a check is needed in advance. Complete a copy of the University Payment Voucher form (47 KB Excel file). Paper forms are available in the second-floor lobby and are online at https://washburn.edu/faculty-staff/finance-office/forms.html. Enter the vendor's name, address, WIN, payee type, and payee status. If WIN is unknown, check the W-9 list (239 KB PDF) which can be found at https://washburn.edu/faculty-staff/finance-office/forms.html. If the vendor is not on the list, a signed W-9 will need to be obtained from the vendor. Enter the SOL's accountant information + Agency Account Requestor in the contact information section. Enter the check delivery method. Generally, the field will read U.S. mail. The business office will hold a check if you need to pick the check up for hand delivery - indicate this in the Deliver to/Hold For area. Enter a brief description of the expense, i.e. "Lunch for Jan 5 meeting". Enter the amount to be paid for each item. Describe in more detail the type of event or expense, including dates, who attended and/or presented, purpose or type of expense, etc. When requesting reimbursement for gift cards, names of all recipients and terms of selection for gift card recipients must be supplied in this area. Supporting documentation must be attached to all payment vouchers before submission. Documentation may include, but is not limited to, original invoices from vendors, or original itemized vendor receipts. Credit card statements cannot be accepted as supporting documentation. All receipts need to be taped to an 8 1/2" x 11" piece of white paper. DO NOT HIGHLIGHT any of the supporting documentation - the highlighted text is no longer readable when scanned. Submit the payment voucher and supporting documentation to the Associate Dean for Administration's office. The finance office generates checks to vendors twice each week, on Tuesday and Friday. Generally, vouchers received before 12:00 p.m. Monday will be paid on Tuesday; vouchers received before 12:00 p.m. Thursday will be paid on Friday. The Finance Office may require up to five days to process a payment. All funds generated for the organization should be deposited into the agency account. Cash amounts should not be retained or distributed for purchases or payment of outstanding bills. If you have cash or checks to be deposited but don't have time to immediately complete the Deposit Form and take the funds to the business office for deposit, see someone in the Dean's Office for safekeeping in the vault. Frequent, timely deposits are encouraged to ensure safe keeping of the organization’s cash. You are responsible for the safekeeping of these assets. Complete two copies of University Deposit Form (59 KB Excel file). Paper forms are available in the second floor lobby or online at https://washburn.edu/faculty-staff/finance-office/forms.html. Enter the organization name and current date. Enter the SOL's accountant information and your name in the contact information section. Enter the monies received by cash, coin, or check. FOAPAL Information (FOAPAL is the University's acronym for Fund/Organization/Account/Program Code/Activity Code/Location Code). Enter a brief description of the monies that are to be deposited - example: Dues, Event Ticket Sales, T-Shirt sales, etc. Enter the amount of the deposit. This amount should be less any applicable sales tax for items sold (see #4 Sales Tax, below). 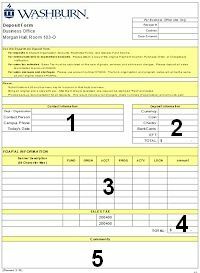 Make certain that the total in the Deposit Information section agrees to the total at the bottom of the form. Fundraising activities are normally subject to collection of sales tax. Activities subject to sales tax include, but are not limited to, merchandise sales, ticket sales, and auction proceeds. Donations are not subject to sales tax. If your deposit is subject to sales tax, the sales tax needs to be deducted from the sales amount provided. 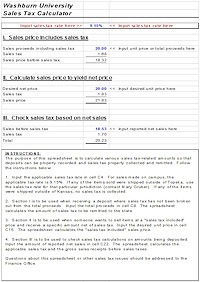 There is a sales tax calculator (13 KB Excel file) located on the University Finance Office website at https://washburn.edu/faculty-staff/finance-office/forms.html. For questions on the taxability of fundraising activities, contact Julie DesRuisseaux, room 219, 670-1872. Provide a more detailed description of the event or activity which provided the funds, and a date of the event/activity if possible. More detail here is better than less. Supporting documentation must be attached to all deposits. Documentation should include a list of payers, check numbers, and amounts paid. Your organization should keep your own list, as well. When cash is deposited, make sure the cash has had another individual count and sign a document confirming the cash total, even if it is a small note. Include this with the deposit slip, as well. Submit the original and a copy of the deposit form along with cash and checks to the Associate Dean for Administration's office for review before making the deposit at the Business Office, Morgan Hall, located in Rm 103-O. After the Business Office has processed the deposit, one copy of the deposit form will be returned to an organization officer. Who has ordered and specifics about individual orders, if applicable (i.e. what sizes, colors, etc.). Who has received the item and on what date (have them initial or sign). Jointly sponsored with Centers, PDO, etc. 6-8 6-8 weeks prior to travel contact the Senior Administrative Assistant, Room 202, to receive a travel packet. Travel Arrangements, including hotel, airline tickets and/or rental car reservations, should be completed by School of Law’s Senior Administrative Assistant in room 202. Within 5 days after your return from your trip, submit travel receipts to Julie DesRuisseaux, Room 219. Travel Expense Reports will be prepared by law school staff and provided to you for review and signature. Travel Expense Reports for trips are not processed until ALL attendees have submitted their receipts.